Happy Monday! Tomorrow is Nikolai's Birthday and Thanksgiving is just a few days away. That being so, it is a good time to give thanks to all of you, and welcome those of you who are new to my blog. For you who are new here, Nikolai was born on Thanksgiving day and his birthdays usually comes with the Thanksgiving holiday. We are always super busy planning and arranging for his birthday party as well as hosting Thanksgiving dinner, I would say that for us it is as busy as, perhaps more busy than, the Christmas holiday. Every year his school has Thanksgiving luncheon, we will be joining them for lunch tomorrow afternoon so I'm not going to make him a birthday bento this year. Nikolai knows that he is my daily dose of joy filling my life with love, laughter and fun! This is a Thanksgiving season bento for today. I used mild cheddar for the lettering, a babybel cheese to make the turkey, which has a cheddar cheese beak, raisin eyes, carrot feet and body, feathers, and wattle made of apple. The nice people over at SayPlease.com generously sent us some of the new holiday edition Lunchbox Love notes, and I included one from their Thanksgiving Edition Volume 4 with Nikolai's lunch. This lunch was packed in his Fit & Fresh container. Also, tomorrow is the last day of school for this month, yay! Happy Thanksgiving! Main compartment: Sandwich with mild cheddar lettering, babybel cheese turkey and granola bar with Lunchbox Love note. Bottom left: Cucumber slices with a turkey cupcake pick. Lovely bento! Happy birthday to Nikolai! Happy birthday to Nikolai! 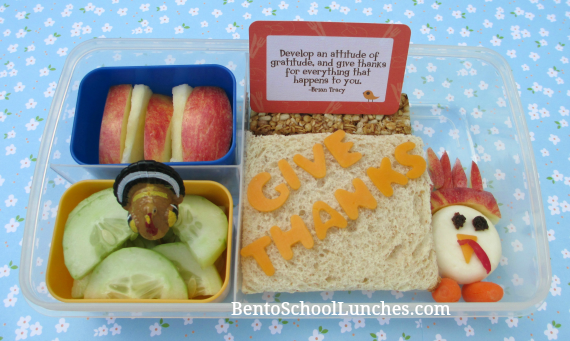 Love this thanksgiving bento. Hope you have a good thanks giving holiday!